Delivery between 1 and 3 days after receipt of payment and confirmation of the final design by the customer. Shipping is by transport agency with home delivery. Delivery 4 to 7 working days from receipt of payment and confirmation of the final design by the customer. Shipping is by transport agency with home delivery. In the Canary Islands the shipment is made by Post as registered mail. Delivery between 2 and 5 working days from receipt of payment and confirmation of the final design by the customer. Shipping is by transport agency with home delivery. In the case of products of small size shipping is done by Post as registered mail. Delivery between 3 to 5 business days from receipt of payment and confirmation of the final design by the customer. Shipping is by transport agency with home delivery. Sales prices outside the EU are VAT-exempt (taxes), you may receive the package to your country Extra expenses are incurred at customs (tariffs). Such expenses will be paid by the customer in all cases. Customs costs may vary depending on the host country, these prices vary depending on the type of product, ecónomico value and conditions of each country. If payment is not produced in custom package automatically revert back to Pro Model Deck, in this case the client can not claim the amount of the purchase because of the costs generated by transport back to Pro Model Deck Spain. Delivery within 1 or 2 working days from receipt of payment. Delivery between 3 to 5 business days from receipt of payment. 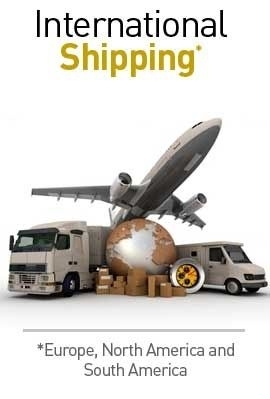 Shipping is by transport agency with home delivery.